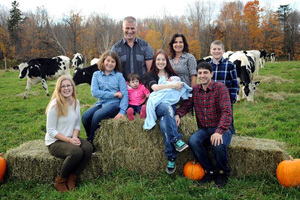 John Schenkels (Class of ’91) describes himself as “expansion minded.” Always looking for ways to expand and grow his family farming operation in Whitney, NB, John came across the perfect opportunity to expand his family dairy farm. In 2006, John saw an opportunity in the wild blueberry industry. “It just made sense at the time,” he explains. John transformed over 300 acres of woodland into a thriving wild blueberry crop. Clearing an average of 60-70 acres each year for eight years, John worked diligently to clear all trees, remove stumps, fertilize the land, control weeds, and allow the blueberries to spread. He has finally reached the density for a profitable field. Four years ago, the Schenkels had their first crop from their blueberry land. Last year, they harvested 140 acres with an average yield of 5,000 pounds per acre. 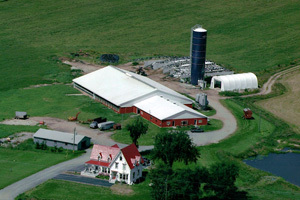 Up until now, the Schenkels farm has primarily been dairy cows since John’s family started farming in 1959. 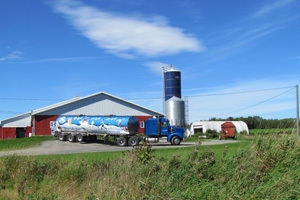 Immigrating to Canada from Holland, John’s parents started the farm with 130 head of dairy cows. John’s father worked tirelessly to maintain the farm and raise his children. John graduated from the Nova Scotia Agricultural College (now Dalhousie University Faculty of Agriculture) in 1991 with a degree in plant science. In 1993, when he was just 23 years old, John took over the dairy farm from his father. Since then, he has always kept his eyes open for new opportunities. Now, ten years after seizing the opportunity to expand to blueberries, he can say he made the right decision. John explains that the expansion to blueberries simply came when the opportunity presented itself. In addition to expanding to blueberries, the Schenkels dairy operation is up to 300 head of cows, almost double what they started with. Although he does work full time on the farm, John doesn’t do all of the work himself. The Schenkels family employs up to eight people in the summer and he also has his family to help him. At 81 years old, John’s father is still involved in the farm. John’s wife, Tamara, helps to run the farm, along with their three daughters, Jordan, 25, Gabrielle, 16, Payton, 11, and their son Hans, 14. For John, it’s important to him that he was able to raise his children on the farm as his own parents raised him. Although John and Tamara are raising the next generation of farmers, they won’t force their children to stay on the farm and take over some day. They encourage their children to make their own choices and do what they are passionate about and what they enjoy, as John’s parents did for him. While John stays busy with business on the farm, he still manages to get involved with boards in the community and in his children’s school. Working on the farm yet staying involved with his community and children is a balance he really enjoys. As for the future, John explains that he will continue to prepare land for blueberry growth. He plans to clear another 100 acres of land for future blueberry production. He is also keeping an eye on the future of the farm as a whole, whether the farm will move into the next generation and what that will look like.